Luke Donald is seeking his first win for four years in the Madrid MastersThe Spanish sunshine failed to brightened Sergio Garcia’s mood as he missed hit first cut on European soil for six years in the Madrid Masters. But while the former world No 2 was left to wonder what fate awaits him when he returns for the US Open in a fortnight, Ireland’s Graeme McDowell was enjoying his golf again after being freed from the shackles of the world rankings earlier this week. The Portrush star faced a worrying wait for Monday’s updated list to see if he had remained in the top 50 and secured starts in the next two majors. In the end he moved up one place to 49th and now he’s reaping the benefits of a clear mind as he posted a second successive 68 to trail his former Walker Cup team mate Luke Donald by just four shots at the halfway stage in the Spanish capital. “I don’t have to worry about top 50 any more,” said McDowell, who started his day by holing a 113-yard wedge for an eagle three at the 10th. “I feel I have done a good job of keeping it out of my head but it is always there in the back of your mind. The brain is pretty powerful. “It was like a weight had been lifted off my shoulders and now I can go and play and it’s nice to come to a reasonably straightforward golf course like this, where if you hit it in the fairway you have got great opportunities with wedges and short irons in you hands. Playing the kind of precision golf that is the hallmark of his game, Donald was seven under with three to play and while he bogeyed his 16th and 17th holes, his 67 was still good enough to give him a one stroke lead over rising star Rhys Davies on 12 under par. The young Welshman celebrated his 25th birthday by carding a 68 to secure his place in the final group alongside Donald today. McDowell will go out just ahead of them with another Welshman, Jamie Donaldson, whose 70 left him three shots off the pace on nine under. Like Donald, McDowell also bogeyed the seventh with a three-putt and then failed to get up and down for par at the tough eighth. Paul McGinley slipped back into the pack on four under par after taking 32 putts in a disappointing 74. Peter Lawrie found some form with the blade for the first time this season as he finished birdie-birdie for a 69 that left him tied with McGinley on four under. 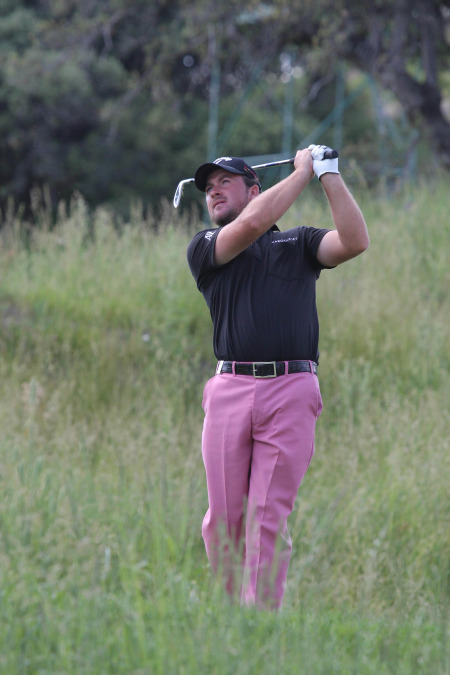 Damien McGrane lamented his lack of fortune as he struggled to a 73 to make the cut with one to spare on two under par while Shane Lowry survived on the mark after a sloppy 74. But Gary Murphy - forced to play with a marker after playing partners Jose Felipe Lima and Andrew Tampion both pulled out after the first round - has now made just three cuts from 12 starts this season after a second successive 73. Former Royal County Down assistant Simon Thornton was also heading home after a 71 left him on four over. Graeme McDowell will need one of the lowest final rounds of his career today if he is to end his two-year victory drought and make a significant move in the race to retain his Ryder Cup place. The 30-year old from Portrush, who is more than €400,000 outside the nine automatic places in Colin Montgomerie’s European team, posted a frustrating two-under par 70 on moving day in the Madrid Masters to go into the final round six shots behind leaders Luke Donald and Rhys Davies on 10 under par. Graeme McDowell reckons he’s ready for a red-hot summer after a sensational closing 65 gave him fourth place behind Luke Donald in the Madrid Masters. 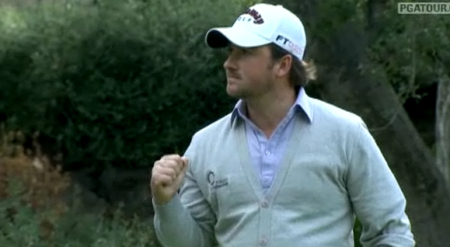 Graeme McDowell continued his love-hate relationship with Valderrama on Saturday. 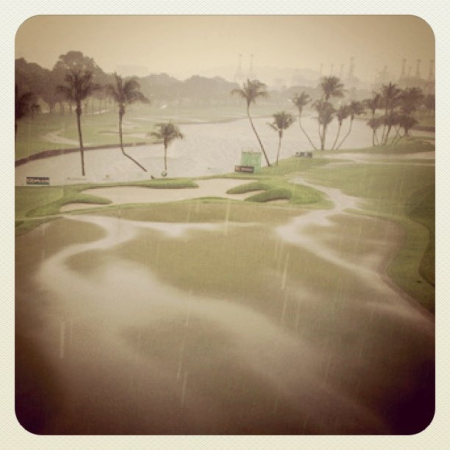 Picture Fran Caffrey www.golffile.ie Graeme McDowell is not the kind of guy to wish his life away. But after shooting in the 80’s for the third time in what has been a disappointing follow up to his incredible 2010 season, he could be forgiven for looking ahead to his Christmas holidays. The world No 15 failed to post a birdie in a 10-over par 81 in the third round of the Andalucía Masters at Valderrama, where he is defending champion.